A pair of blinding white lights barrels towards me out of a sea of blackness encircled by a ring of foliage. My heart skips a beat as the vehicle whose headlights briefly blinded me swerves back into its own lane, having avoided the obstruction that is merely a black void to our stunted vision, probably a disabled bemo (a small, under powered mini van). 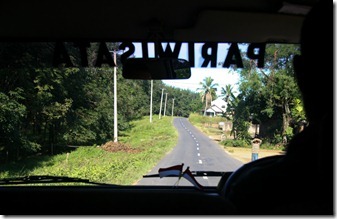 I am sitting in the passenger seat of a standard mini van on the roads of Indonesia. My driver, Itang, has been skillfully wending through the highways, local roads, and half gravel half pothole back roads that lead from Jakarta to Pelabuhan Ratu. We’ve been traveling nearly 3 hours. The roads around Jakarta are surprisingly first world, considering I’ve heard Jakarta compared to Mexico City, an image that the state of affairs at the airport tends to reinforce. 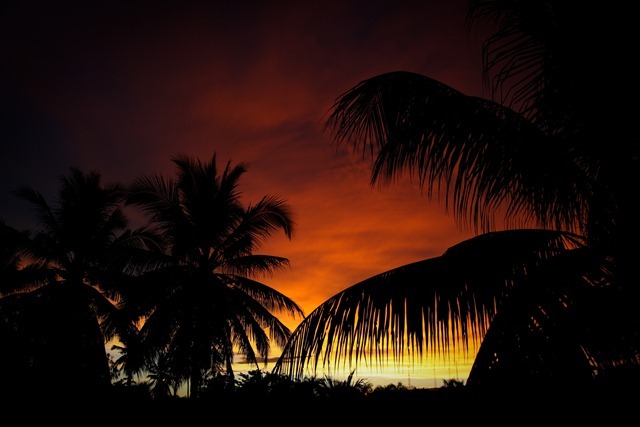 As you haul along the 3 lanes of smooth blacktop, green direction and exit signs flashing past, glassy sky scrapers erupting from the mix of green palm trees and red clay tile roofs in the distance, you could almost forget you weren’t in The States; were it not for the fact that you’re driving on the left side, and the shoulder is more often than not used as a passing lane. Every third truck on the road here is carrying water (in the blue plastic Mulligan Man bottles). I’m not sure where from or where to, but the idea of water mains and pipelines seems to have no place here. These trucks, so massively overburdened, tend to have a hard time keeping the pace, so the difference between slow and fast lanes is often 50 KPH (the ratio of Kilometers to Miles is about 5:3 FYI). 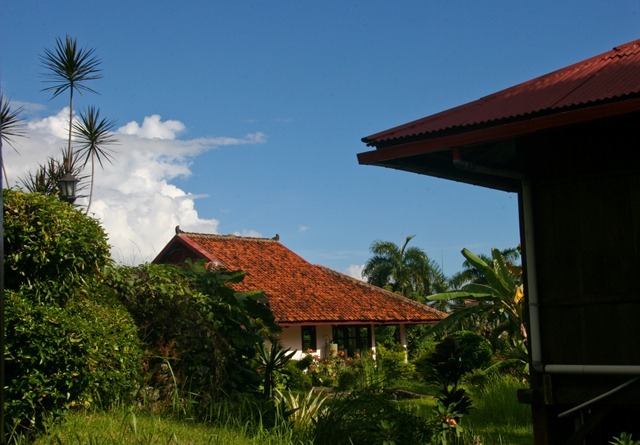 It’s not until we reach Bogor, a city about half way between Jakarta and Ratu geographically but certainly not temporally, that things get really interesting. When we reach Bogor, the multilane blacktop freeway, rest stops with Mc Ds and Pizza Huts, and all other trappings of the first world end abruptly. The road is suddenly one narrow lane in each direction, with a 5 cm drop off to a gravel and mud shoulder. The narrow should is flanked by shack after bamboo shack peddling anything from fruit to cell phone SIM cards. The rest stops sporting Big Macs have been supplanted by warungs (food stalls) advertising their nasi goreng (fried rice) in big red letters. Where vehicles stop in order to frequent these establishments would be a mystery to me, except that every mile or so we have to eek our way around some car parked half on the shoulder half in the road, and that’s excepting the angkot (bemo used for public transport) receiving or discharging passengers. As the sun begins to set, and the traffic thicken, the organized chaos of the roads turns to full fledged anarchy. Bemo and car alike have started using the shoulder as another lane, despite its rut worn, occasionally washed out nature, as we try to pass the lumbering, oversized tour buses that look so out of place on the narrow lanes, next to the mini-mini-vans of Indonesia. The mopeds are weaving in and out of traffic with such speed and through such tight spots it puts New York bike messengers to shame. And yes, we’re still on a road lined be shacks, sometimes peddlers, sometimes homes, and not for lack of distance traveled, for the landscape remains thus, unchanged, for miles. It’s as if the city failed to ever develop outwards, but instead stretched on, for seemingly endless miles, lining the highway, like vegetation clinging to the banks of a river in the desert. 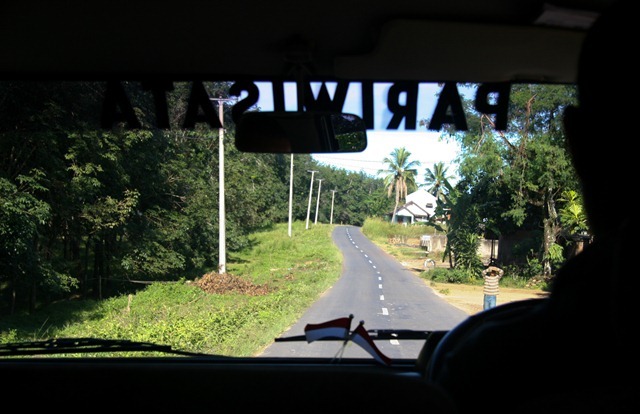 Eventually, as traffic grinds to a near halt, Itang veers off onto one of the seldom seen side roads. I’m not sure if we’re taking a detour to avoid traffic or if this is the normal route, but this road is much narrower, closer to one lane although we pass oncoming vehicles at near full speed, and frequently pocked with man sized potholes, which we rapidly decelerate for, or swerve around, depending on the size of the next oncoming vehicle. Motorcyclists and pedestrians alike seem unfazed but the 250 some odd kilos of steel hurdling towards them, and Itang drives with what seems like a willful disregard for life. 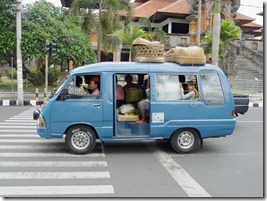 But really he just doing what it takes to get somewhere in rural Indonesia. The local roads, in such disrepair that they are, are also "toll roads." But no booth or uniformed official will you find, instead local villagers stand at the entrance and exit of their village collecting a tax for your passage, like the highwaymen of old. The supporters of the local mosques just stand in the center divide accepting donations instead, much to the chagrin of the lane splitting mopeds. s that might dissuade them. 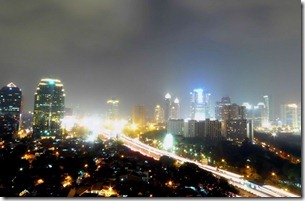 Jakarta Skyline: This file has been released to the public domain. See http://commons.wikimedia.org/wiki/File:Jakarta_Skyline_(Resize).jpg for more Information. A Bemo: This file is licensed by っ under the Creative Commons Attribution ShareAlike 3.0 License. See http://commons.wikimedia.org/wiki/File:Bemo,_Gianyar_200507.jpg for more information.